The series of posts on France continues! The rain continued to threaten, but we paid no attention. A quick private tour of Musee d'Orsay began our day and provided plenty of comic relief. The tour guide's limited supply of English words dictated his plain and simple descriptions. Example: (with French accent) "This is very famous painting. It is by Claude Monet. It is blue. Claude Monet is famous artist. Painted in 1916." Here's the good news. There was a line around the museum for entry in large part due to the Louvre being closed, and we sashayed right in with our tour guide. Although he didn't provide any major groundbreaking insight, he did guide us through the museum with ease, and the opportunity to see the paintings was certainly enough. Truly spectacular. Famous artists who worked and lived in the Montmartre community made it the principal artistic center of Paris at the end of the 19th century... Artists like Salvador Dali, Amedeo Modigliani, Claude Monet, Piet Mondrian, Pablo Picasso and Vincent van Gogh. Today, local artists still draw inspiration from the area and display and sell their work at the top of the hill. I brought home this charming collection of watercolors. Of course we made sure to see the shops of Paris... this particular Hermes store was a highlight. Just beyond the flower boutique at the entrance is the unusual surprise of the Hermes shop seen below. Dinner that night was very special... as in immensely special. 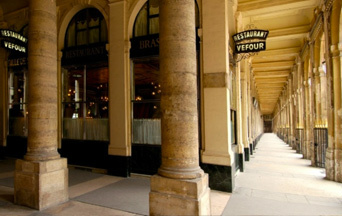 Le Grand Vefour is the perfect place to create a memorable evening. Check out these fancy desserts! The food was fabulous, the wine exceptional, but of course the friends were the best part. More France coming up... St. Emilion is next! More beauty from my favorite city........merci! I am enjoying visiting Paris with you. Thank you for sharing your trip with us. It is a bright spot to escape and feel inspired. Those affected by the storm would be the first to say keep posting and want to enjoy your post when they are able to be restored to their normal activities. Our hearts and prayers go out to all those affected by the storm. I'm so enjoying this vicarious trip through Paris with you. Such gorgeous photos and memories of my own Paris travels. Such a smart idea to book with a guide for the D'Orsay. We took one look at the line on our last visit and walked away! Glad you had better luck than we did. Hey Jan, back after 10 looooong days of being in the dark literally and figuratively. Its been crazy!! So good to be back though. Love love love Paris and looks like someone had a fabulous time. The inspiration and beauty is simply intoxicating (and delicious as you have shown). Glad it was wonderful...and no where is rain more beautiful than in Paris! !